I'll admit it. We're not really football people. But, that doesn't mean we don't know great game day fare when we see it. In fact, we've been known to throw a mean Super Bowl party... with an emphasis on Puppy Bowl and commercial watching, of course. But even so... it's really all about the food anyhow. Isn't it? 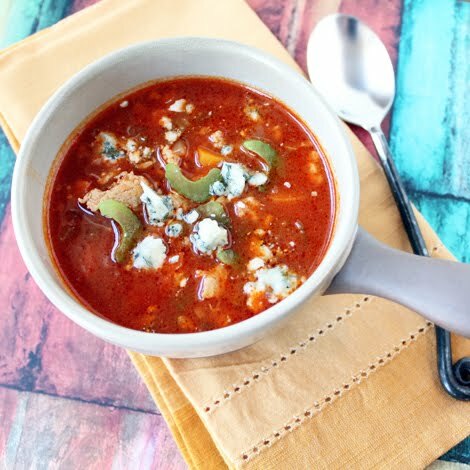 Since the Super Bowl tends to fall at one of the coldest times of the year, it's a great time for soup. And chili always seems to be a perennial favorite for parties. But, you don't need to make the same old boring recipe. Creamy blue cheese, crisp celery, succulent chicken, and a nice hot sauce kick. These are the things that make the buffalo wing a perennial favorite. But, deep fried wings aren’t exactly every day fare. 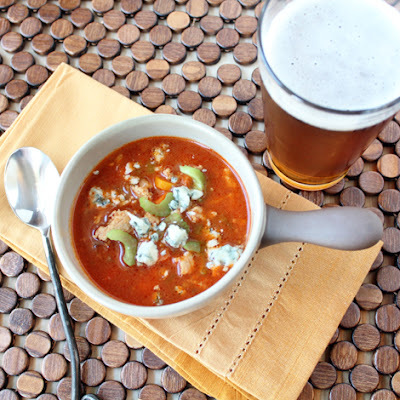 This recipe pulls together all the flavors you love from buffalo chicken wings into a nourishing soup that’s perfect for a weeknight meal or an afternoon of watching football (or commercials) with friends. A topping of chopped celery and creamy Gorgonzola cheese gives the soup texture and an added layer of flavor. If you’re not a blue cheese lover (though we encourage you to give it another try), sub out the Gorgonzola for Feta cheese or Queso Fresco. For even more of that "chicken wing" feel, use shredded roasted chicken added toward the end of cooking instead of the ground chicken.